Since version 4.1.0 on the "System" page it's possible to export/import data file. Note: Users' and bots' passwords are not included into data file. In order to export data file click on "Export" link in "Export data file" section. Use "Import data file" button in "Import data file" section for import after import options are set. If "Clear system" option is set then all current data will be cleared from the system before the import. If "Simple" option is selected then nothing is deleted and only new data (that don't exist before the import) will be added. 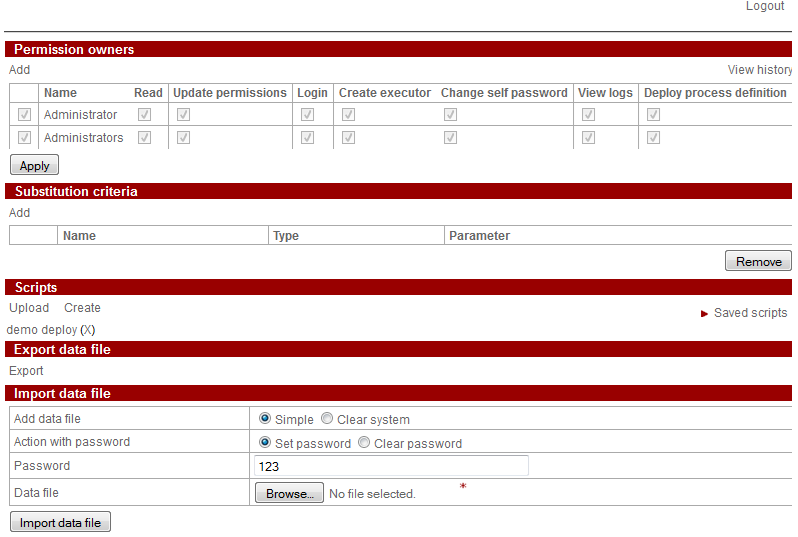 Here you can choose if you want to set or leave empty (clear) passwords for users and bots. If "set password" is selected then type in the default password in the text field below. Click on "Browse" button to choose data file for import. When everything is set click on "Import data file" button. If any error occurs during import then the error message will be printed on the top of the page. This page was last modified on 13 January 2015, at 23:22.